QCSS lens manufacturing utilizes both traditional and modern manufacturing techniques to create the correct solution for the desired design goals. Traditional lens production uses a mold together with grinding and polishing compounds to create a spherical lens shape. Production must be very carefully controlled and requires much artisanal expertise to insure that the production process proceeds as desired and quality is not compromised. - Low to Medium Volume (100,000's). - Size: Diameter of 2 mm ~ 250 mm. High Volume lens production uses injection molding techniques to create optical surfaces that are very inexpensive on a per unit basis. Production throughput however is affected by many factors including the desired surface precision and the lens size. - Medium to High Volume (1,000,000's). - Size: Diameter of 2 mm ~ 100 mm. 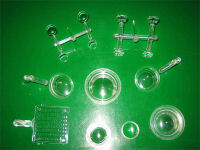 Injection molding concepts can be applied to optical glass to create very precise, aspherical lens elements. Aspherical lens elements can reduce the number of optical elements, reducing both weight and size of an optic assembly. 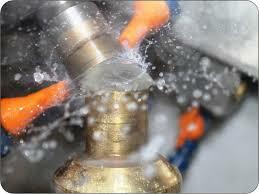 Glass molding requires advanced equipment and is only available from limited vendors. Also the cost of lens design and tooling is high. - Material: Pre-formed glass blanks. - Size: Diameter of 2 mm ~ 30 mm.